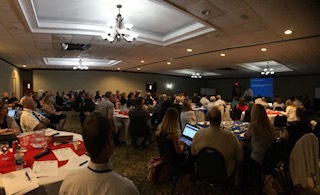 The 2018 DCMO BOCES Safety Summit gathered educators, law enforcement representatives, and community leaders to explore strategies and learn from seasoned professionals, multiple tactics to assess threat and prevent school violence. Retired Chief Arthur J. Kelly from the New Bedford, Massachusets Police Department shared with attendees major findings from the Exceptional Case Study Project (ECSP). From his role with the U.S. Secret Service with the National Threat Assessment Center, he discussed multiple examples with the tactics used to obtain information and assess threat. Attendees commented on the value of the program and the relevancy to current affairs. The afternoon session featured a presentation on Crisis Communications delivered by A Wesley Jones, the City of Norwich Director of Emergency Management. DCMO BOCES Health and Safety, Richard Shaw, discussed school incidents and strategies for team building. This last session provided everyone an opportunity to identify opportunities and develop action plan outlines to further protect the safety of all our students.